Four new aircrafts will be released soon in the WW2 Wings of Glory line: Gloster Gladiator Mk.I, Fiat CR.42 Falco, Bristol Beaufighter and Messerschmitt Bf.110C, and once again it’s time to learn something more about these fighters. 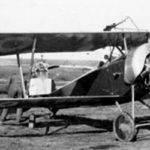 This series of preview articles starts with the British single-seat biplane Gloster Gladiator, which was widely employed during the early days of World War II. 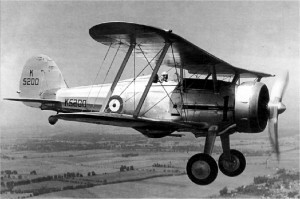 Produced by the Gloster Aircraft Company, the Gloster Gladiator was the last British biplane fighter and the first fighter with an enclosed cockpit. It was ordered into production by the Royal Air Force in July 1935, in an attempt to bolster the ranks of Fighter Command, providing a stop gap for a short period. However, Britain's urgent need for combat aircraft led to orders for an eventual total of 581, including 350 Gladiator Mk IIs, which had improved equipment and three-blade metal propellers. The Gloster Gladiator Mk.I, employed during the early days of World War II. The Gloster Gladiator design had a basic metal construction with fabric covering. The forward and rear spars were made of high tensile steel and the wing leading edges were made of duralumin. The Gladiator Mk.I was powered with an 830 hp Bristol Mercury IX radial engine and reached a maximum speed of 407 km/h at 4,400 m. It was armed initially with two synchronized .303 Vickers machine guns on the fuselage, two .303 Lewis machine guns, and one beneath each lower wing. Later, the armament became four Browning .303 guns, two mounted on the fuselage and two mounted on the wings. The first deliveries were in January 1937, and when the WW2 started, there were 13 Fighter Command squadrons equipped with the Gladiator, and two squadrons were used in the French and Norwegian campaigns. 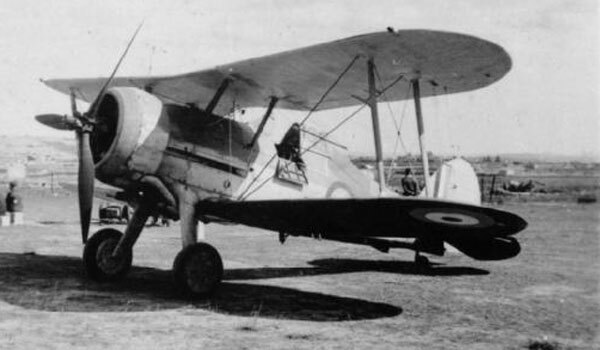 The Gladiator was largely replaced in front line RAF service by the Hurricane and Spitfire after the outbreak of the war, but it saw service in several campaigns during the early years of the conflict (1939-1940), in North Africa, Greece, and Palestine. The fighter was also one of Britain's biggest pre-war export successes, seeing service in many countries - Belgium, China, Egypt, Eire, Finland, Greece, Iraq, Latvia, Lithuania, Norway, Portugal and Sweden. One of the Sea Gladiator that served in the defense of Malta in 1940. The variant Sea Gladiator flew for the first time in 1938, and was very successful, since its slower speed made it suitable for carrier operations and it was less likely to be facing more modern fighter opposition. With an arrestor hook, dinghy fairing, and catapult points, the Sea Gladiator served aboard the aircraft carriers Courageous, Eagle and Glorious. A handful of Gladiators were based in Malta when Italy joined the war in June 1940. For the next month, just four aircraft were the island's only defense against the Italians. In the next article, we'll talk about the pilots of the three Gloster Gladiators featured in the WW2 Wings of Glory Airplane Packs. Information sources: WW2 Aircraft, WW2 Vehicles, Wikipedia, Shuttleworth, Battle of Britain Historical Society.